Hot on the heels of last nights callout the team were called by Police Scotland at 00:10 on 22 January 2018 to search for two missing walkers on the Southern Upland Way. The walkers had set off from the Tibbie Shiels Inn in the morning with the intention of walking to Moffat along the Southern Upland Way. They did not return home and were reported missing by their family. 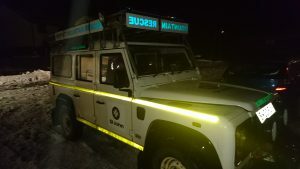 Moffat and Tweed Valley Mountain Rescue Teams were both called out and worked together with Police Scotland officers to search the Southern Upland Way from both ends. 15 members of Moffat Team and 8 members from Tweed Valley battled atrocious conditions with low cloud, deep snow drifts and and an increasing avalanche risk. Progress was very slow and some of the teams needed skis to make progress on the ground. A coastguard helicopter joined the incident and search dogs were on their way from further North in Scotland and the Lake District. Finally at 05:30 in the morning members, of Tweed Valley MRT located the pair tired but otherwise unharmed. Unfortunately the poor weather meant the helicopter was unable to assist in the evacuation and ground teams are presently evacuating the missing walkers from the hill. Deputy Team Leader of Moffat Mountain Rescue Team, James Coles said “The walkers were well equipped and prepared for their day on the hill but the conditions seemed to be much worse than they might have expected. Both teams are tired but extremely pleased that the missing walkers have been found safe and sound”.